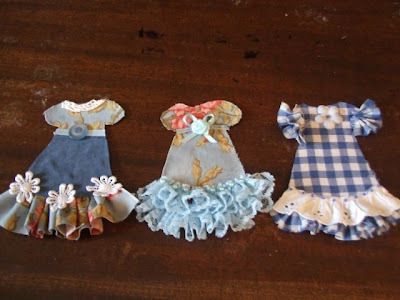 Paper Doll Dresses are a huge hit in Blogland at the moment. Lots of ladies missed out on getting into the swap, Mum and I included, but we are all flat out making them anyway. Mum and I are turning them out on a nightly basis! We have a funny, friendly little competition going on where we pretend not to like the other one's. We have got Stella involved in it. I thought my first 'collection' were pretty good really until Mum started! We now have Stella saying Mummy's dresses are gastly and Nana's are beautiful! There is some truth to that actually! Nana's dresses, like Nana's personality are totally over the top. I actually got a bit worried, so have revisited mine, (telling Mum and Stella that I hadn't actually finished them) and am foofing them up - dramatically! I can't be outdone in my very own home! Karla mentioned in her post that she loved her paper dolls as a wee girl. Paper dolls have a long history in my family also. My Granny was an incredibly talented woman. She made her own paper doll as a girl which was a 1920's movie star. The doll looked like a flapper girl and she had the most glamourous wardrobe that Granny had designed and hand painted. I remember this soft dove grey coat that had a pink fur collar and cuffs. Also a long slinky silver evening gown. She had day wear, night wear, accessories etc. I loved playing with her and Granny made me a little sister to go with her that I would paint clothes for. Mum also loved paper dolls and as a little girl I used to play with hers also. They were in a brown cardboard box and divided neatly into compartments, as only Mum would do, even as a kid! They were 1950's dolls and even as a little girl I loved the vintage-ness of them. As a little girl in the 1970's I had my own paper dolls. My best friend Corienne and I each had a family of them and we would fashion clothes for them from an old Simplicity Sewing Pattern Book, Mothercare Books and magazines. We would just pop our dolls down on the garment we wanted, trace around the doll and cut it out! Hours and hours were spent playing with our dolls. We would take over entire living rooms and make houses for them. My Princess Stella also loves paper dolls. She has a box of them (now organised into plastic bags by Mum!) that she loves to play with. Her's are mostly fairy paper dolls! If anyone would like to do a Paper Doll Dress Mini Swap with Mum and I, leave a comment with your email address.